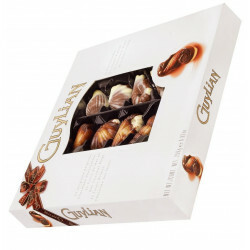 The original Guylian chocolate Sea Shells, with their delicious praliné filling, are an exquisite combination of refined taste and time-honoured tradition, whose famous quality is savoured by connoisseurs worldwide. 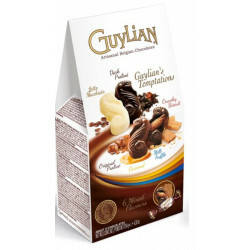 Each ingredient is chosen with meticulous care so that only the finest West African Cocoa beans, Mediterranean hazelnuts, sugar and local milk powders are used to produce the unique Guylian taste. These traditional recipes, for which Belgium is an international quality standard, combined with the unique roasting systems developed by Guylian, produce the Guylian praliné filling that chocolate connoisseurs love. The inimitable brilliance and beautiful sculpted marble shape of the 11 different Guylian chocolate Sea Shells create a perfect collection. These works of art are then beautifully presented in the famous Guylian transparent boxes that illustrate this unique product’s perfection and suitability for every chocolate occasion.